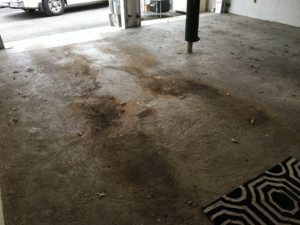 Take a look at the finish of the concrete in the photo above, you’ll notice that it was very poorly finished, not to mention how dirty and oil stained it is. It’s full of swirl marks with large ridges and deep grooves. 99% of the time diamond grinding can take care of prepping a slab for an epoxy coating but in cases like this where you have deep swirl marks or the floor is pitted then the best solution is to shot blast. Shot blasting will clean out all the low spots while a grinder would ride along the top of the ridges and not get down into the valleys. You can do an aggressive grind followed by a couple of strong Muriatic acid washes if you have the time. The acid will clean out the low spots. We would do a final rinse with TSP powder to neutralize the slab back to the proper PH. 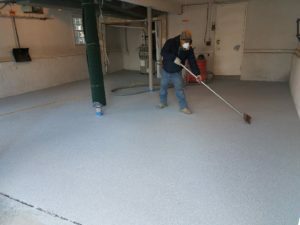 So if your floor looks like the above and you want to shot blast it yourself we suggest you do either our Armor Granite or a full broadcast color flake installation. Full broadcast is simply covering 100% of the floor with color flakes, thus hiding all the floor’s imperfections. The Armor Granite is about a 90% coverage and in most cases will hide all the imperfections. We offer a full broadcast version of the Armor Chip garage epoxy kit. We would strongly recommend the Armor Granite for two reasons, it’s much easier to install and it’s less expensive. It’s also a gorgeous finish. Full broadcast is not as easy as it looks. You need a tremendous amount of chips to start with and it’s very easy to end up with uneven blotches and lumps of the colored flakes. Here’s a quick rundown of how to do a full broadcast. As you apply each section of the epoxy you walk in the epoxy with spike soles, don’t even think of doing this without spikes. We would suggest you have a good size box of flakes in one arm and with the other take large handfuls and toss them in the air in a left to right arc at about a 45 degree angle. Try to avoid throwing them straight up in the air. This will result in the dreaded lumps and blotches of flakes. You will do the floor one section at a time until complete. Once the epoxy has dried you will need a good floor scraper such as the one in this photo. Notice how the floor is fully covered with flakes. With the scraper you will remove all the loose flakes, the flakes sticking up and hopefully any lumps you have created. Once fully scraped down you need to vacuum the floor with a shop vac. If you still see some spots not to your liking, you can hit them with some 80 grit sandpaper to smooth them out some more. Next you will now need to apply the topcoat and you will have to do two coats since all those flakes create millions of nooks and crannies. Do one coat and let dry, apply second coat with 24 hours with a nonslip additive for traction. 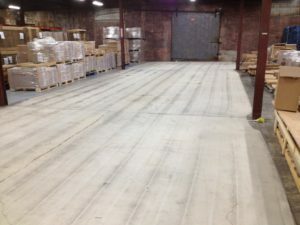 Let dry and now you have a full broadcast epoxy floor.